Put away the mop and eliminate the bucket for a more productive and more hygienic microscrubber that is faster, safer and will result in cleaner floors than the traditional mop and bucket. Microscrubbers will provide you with clean and dry floors and are easier to use than a mop. Cleaning cramped, high traffic areas has always been a challenge for convenience stores, coffee shops, fast food restaurants, and gas stations – any place where space is at a premium. Ensure clean, streak free floors with optimal water recovery that eliminates streaks and maximizes soil removal. The mop and bucket spreads dirty water around the floor, leaving the floors not too clean. Microscrubbers clean the floor like a large scrubber. They wet, agitate and recover the dirty solution. Microscrubbers leave floors clean and dry in a single pass, making them ideal for day cleaning. They also use clean solution throughout the entire cleaning process, which eliminates cross-contamination. Microscrubbers can also clean up to five times faster than when using a mop and bucket. There’s another big advantage to these revolutionary microscrubbers besides their compact size and easy maneuverability. They reduce the risk of slip and fall hazards by picking up all water that mopping leaves behind. Microscrubbers clean and dry floors in a single step. The optimal water recovery even in 180° turns helps minimize the risk of slip and fall injuries in your facility. Microscrubbers have intuitive, easy-to-understand controls that are designed to simplify training and reduce having to re-clean an area. All microscrubbers offered by WAXIE’s equipment partners have a low operating dBA noise level that enables energy saving daytime cleaning. Equipment manufacturers have rolled out micro versions of walk-behind and ride-on automatic scrubbers that are optimized to compete with the performance of larger equipment and can automate cleaning of hard to reach areas otherwise handled by mops. These mini autoscrubbers, which have smaller batteries, smaller cleaning deck sizes, and smaller squeegees, are becoming increasingly popular among professional end users because they can be used virtually anywhere that a mop and bucket can. In some cases these small autoscrubbers take up the same amount of space in the janitor’s closet as a mop and bucket. In many facilities, a large ride-on or walk behind autoscrubber is simply too big for the job at hand. Micro-autoscrubbers, however, have proven very valuable for small areas, high traffic quick cleaning in food service, educational institutions, office buildings and hospitality facilities. Because these scrubbers are so small in size, they can be used to easily clean under tables, desks and counters, eliminating the need for custodians to move furniture or manually clean these areas. They are being used to clean under partition walls and around toilets and wall mounted sinks in restrooms. They work well in congested restaurant kitchens, entryways, fitness centers, cafe’s, patient rooms and many other small areas where a quick cleanup is needed. Designed for applications less than 10,000 sq. ft., Microscrubbers are perfectly sized for these types of facilities. A custodian using a microscrubber can clean up to 5 times faster than when using a mop and bucket. Equipment manufacturers are also designing smaller rider and stand-on scrubbers starting in the 20 inch range that are small enough to fit comfortably in elevators in facilities that have multiple floors. These smaller ride-on and stand-on scrubbers also have a smaller footprint than standard walk-behind machines, allowing for increased visibility, operator ergonomics and efficiency while still achieving a clean, dry and safe building environment. There are three new microscrubber solutions designed to clean small spaces fast, without the mess and slip and fall hazards of mops and buckets: the Advance SC100™, SC250™ and SC351™ Microscrubbers. The Advance SC100™ is an upright scrubber designed to make cleaning faster and easier than using a mop and bucket. With a 12-inch cleaning path, the SC100 is designed to maneuver where other scrubbers can’t, and with a tank that dispenses only clean solution, it won’t spread dirt around like mops and buckets. Ideal for small office spaces, with the low deck profile and offset allows to clean difficult to reach areas. The SC100 is perfect for hotel/conference halls with carpet areas thanks to the fast interchangeable carpet kit. Click here to view the Advance SC100™ brochure. The Advance SC250™ is ideal for scrubbing in tight corners or under tables or chairs. It’s adjustable and foldable handle makes transport and storage easy. Easily raise the front squeegee to sweep up small debris while scrubbing, thereby minimizing the need to pre-sweep. Designed to pick-up water in forward and reverse directions, the SC250 ensures a clean, dry, more hygienic environment while decreasing chances for slip-and-fall accidents. The SC250 uses a powerful 36 V Lithium battery that provides up to 40 minutes of run time and operates at only 66 dB A, allowing for daytime cleaning and cleaning of noise sensitive areas. The cordless design ensures a safer cleaning environment and flexible cleaning options. The Advance SC351™ is suitable for small to medium sized areas like schools or hospital halls. Use it anytime thanks to its low decibel level. Ideal inside restaurants and small supermarkets, the Advance SC351 provides deep cleaning performance with the rotating disk deck, perfect to scrub and dry in any direction, even in narrow spaces. Never skip those hard-to-reach areas again. By using the SC351, with its integrated rotating deck, operators are ensured the flexibility to clean under and around obstacles. The rotating deck allows for water pick-up in all directions—including reverse. Windsor Pivot - Versatility is the key advantage to this hybrid machine. The Pivot bridges the gap between a floor machine and a walk-behind scrubber making it more versatile than other machines in this price range. The roller brushes allow it to deep clean difficult surfaces such as tile and grout or uneven floors. Ditch the mop with the more productive and more hygienic Saber Blade 12 or 16 microscrubber. These machines will provide you with clean and dry floors and it is easier to use than a mop. It is as easy to use as an upright vacuum which makes it perfect for any professional setting. Dirt and contaminants are captured and removed from the floor without worker contact. for cleaning tight, hard to reach areas. Comes complete with an on-board battery charger for ease of recharging. The parabolic squeegee completely picks up all solution off of the floor. Engineered for light, convenient cleaning in small area commercial applications such as classrooms, offices and bathrooms. The ergonomic design, simple operation and a compact body make the Wrangler 1503 the best value in Micro-Scrubbers. Designed for applications less than 10,000 sq. ft., this Wrangler is perfectly sized for restrooms, convenience stores, and nursing home rooms. 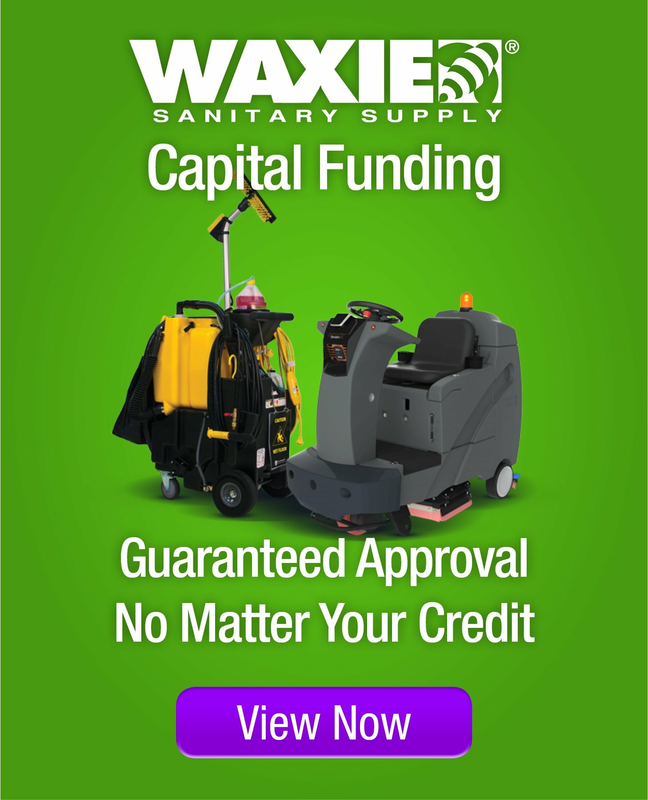 Get Started with a WAXIE Machines Specialist Now!